The Soviet T-54/T-55 tank series is hands-down, all-time most popular tank in history. 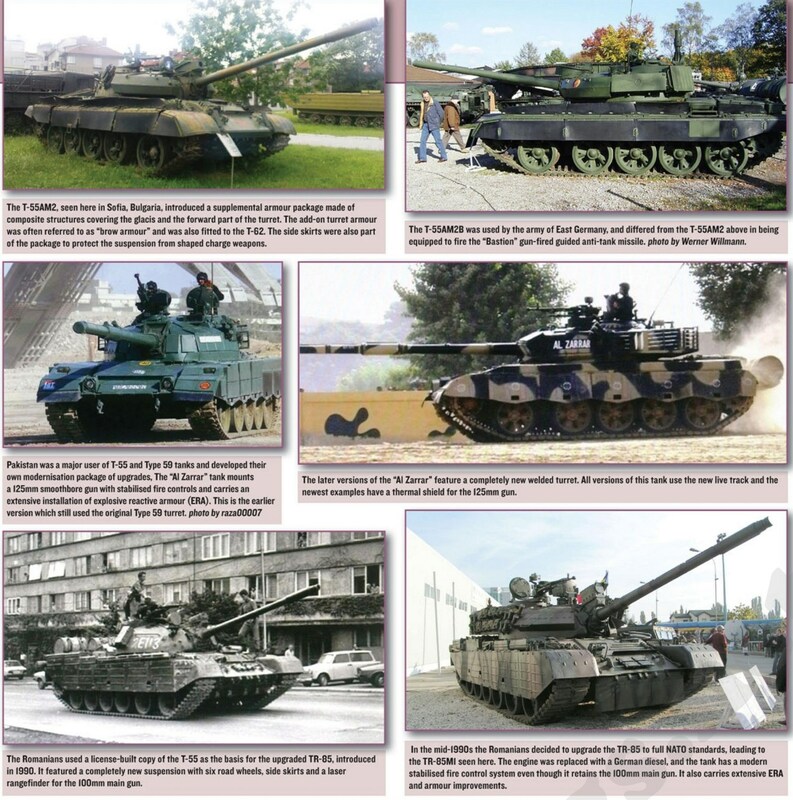 Perhaps 28,000 examples have been built: and these tanks have served with no less than than 50 armies and quasi-armies throughout Eastern Europe, the Middle East, Africa, Asia and South America. The T-54 was developed immediately after World War II; the first prototype appeared in 1946, and it went into Red Army service by 1950. The very similar but improvedT-55 followed in 1960. The USSR supplied and licensed them at favourable terms to its satellites, and to other favored clients as part of its drive for world-wide influence throughout the Cold War. The series was adaptable; improvements were steadily incorporated, and many specialist modifications and conversions were carried out over the years. 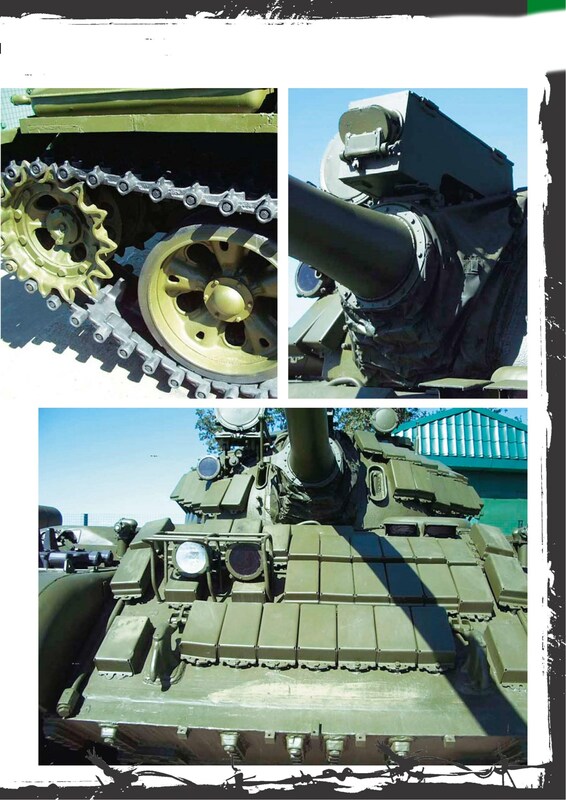 Russia was still buildingT-55s in 1979; and they are readily available today for about S 10,000 US per copy. The T-54/T-55 family have seen combat on many battlefields, but will forever be associated with the Middle East wars of 1967 and 1973. In the Sinai desert in 1967 the Egyptian Army lost nearly 400 to Israeli aircraft and in battle with Israeli M48 Pattons and Centurions. In October 1973, after a much more evenly balanced start, enough were captured for Israel to take them into service, with suitable modifications – a considerable compliment. In the savage tank battles on the Golan Heights in 1973 Syrian tankers very nearly broke through Israel’s defensive line. Several hundred Indian Army T-54s and T-55s also saw action against Pakistan in December 1971 – interestingly, coming up against Pakistan’s T-59s, the Chinese-built version, in the Chaamb sector. Honours were roughly even, despite the Indians having the advantage of better AP ammunition and infrared night fighting systems. These active IR systems, fitted to the T- 55 since the late 1950s, were useful back then, but are a real hazard on the modern battlefield. One IR searchlight is slaved to the main gun, and a smaller one is installed on the TC’s cupola, allowing him to search for and acquire targets. IR radiation is invisible to the unaided eye, but highly visible to anybody on the battlefield with a similar system; a tank which powers up an IR searchlight is essentially shouting “Over here, guys!” to any enemy tank with an IR viewer within line-of-sight. Modern passive night vision systems have entirely outclassed IR nowadays. More than 3,500 T-54s and T-55s made up the bulk of Saddam Hussein’s Iraqi armored force during the 1990/91 Gulf War; huge numbers of these were destroyed by US aircraft and later Coalition ground attacks. While the T-55 was a great tank in its day, that day has passed; it is totally outclassed by tanks like the M1 Abrams – whose fire control systems can easily home in on it in any light conditions; whose gun can easily outrange and penetrate it; whose armor is virtually impervious to its AP rounds; and which can outmanoeuver it on any battlefield. A plethora of variants and modernization upgrades have been built. Here are but some of them. Early on during the production T-55s were fitted with the TSh-2B-32P sight. Starting in 1970 T-55s were being armed at Uralwagonzavod 12.7 mm DShK 1938/46 or KPVT loader’s anti-aircraft heavy machine guns. 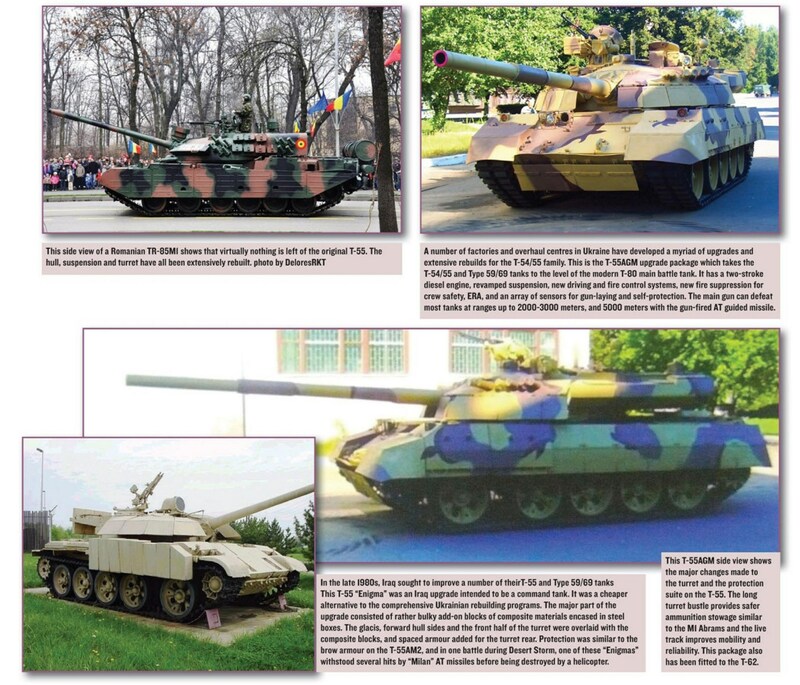 These tanks were known as Model 1970, or sometimes T-55AM. KTD-1 or KTD-2 laser rangefinders and R-123 or R-123M radio sets were fitted to older tanks starting in 1974 (Model 1974). At the same time efforts were made to modernize and prolong the life of the drive train. T-55 fitted with the ZET-1 vehicle protection system. It has net structure centred on vehicles main armament and flipper-type side plates. T-55M (Ob’yekt 155M)/T-55AM (Ob’yekt 155AM) – Modernization of respectively T-55 and T-55A with new “Volna” fire control system, 9K116-1 “Bastion” ATGM system with new 1K13 BOM guidance device/sight, improved “Tsiklon-M1” gun stabilization system and TShSM-32PV sights, V-55U engine, improved suspension and RMSh tracks, increased armour, anti-mine, anti-napalm and improved anti-radiation protection and new R-173/173P radio set. Visual differences include a laser range-finder in an armoured box fitted over the main armament, side skirts, 81 mm “Tucha” smoke grenade launchers, BDD turret brow armour and glacis appliqué, and rear RPG screens (only used rarely in Afghanistan). T-55M-1 (Ob’yekt 155M-1)/T-55AM-1 (Ob’yekt 155AM-1)  – The “-1” suffix was applied to later modified tanks that are powered by the 691 hp (515 kW) V-46-5M engine, which was derived from the T-72’s 780 hp (582 kW) V-46-6. T-55AD “Drozd” (Ob’yekt 155AD) – T-55A fitted with Drozd (‘thrush’) active protection system (KAZ – kompleks aktivnoj zashchity). Soviet Naval Infantry saved money by installing “Drozd” on a small number of tanks instead of opting for appliqué armour, or acquiring newer T-72s. About 250 were kept in stores for secrecy, but later switched to simpler reactive armour. T-55AD is also fitted with the radio set R-173, sight TShSM-32PV, “Tsiklon-M1” stabilizer etc. of the T-55AM. T-55AD-1 (Ob’yekt 155AD-1) – Version powered by the 691 hp (515 kW) V-46-5M engine, which was derived from the T-72’s 780 hp (582 kW) V-46-6. T-55MV (Ob’yekt 155MV)/T-55AMV (Ob’yekt 155AMV) – “V” for vzryvnoj (‘explosive’) designated tanks, which carried “Kontakt-1” explosive reactive armour (ERA) instead of the passive BDD armour. The ERA bricks (EDZ or elementi dinamicheskoj zashchity) are normally mounted on the turret front, hull front and the hull sides. This variant was adopted by Soviet Naval Infantry first, and by the Russian Army after the collapse of the Soviet Union. The T-55MV is a modernized T-55M and the T-55AMV is a modernized T-55AM. 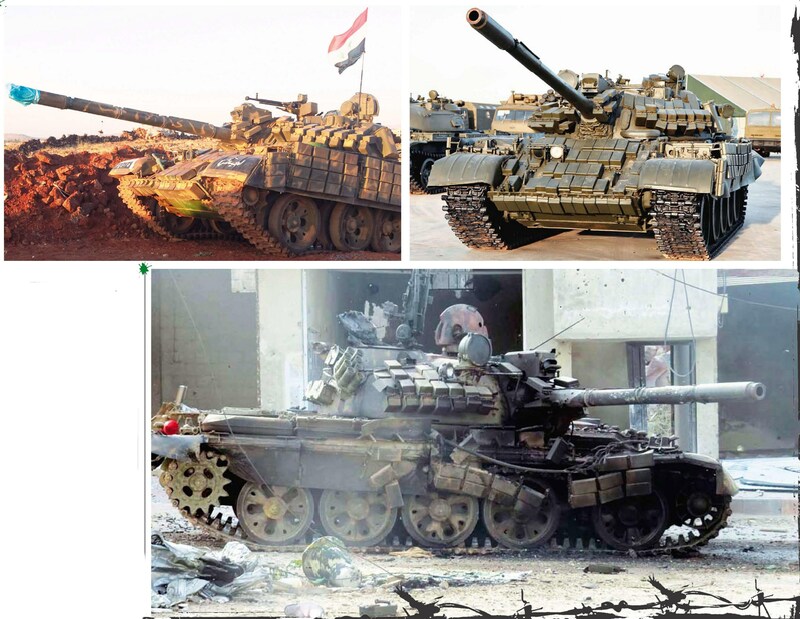 T-55MV-1 (Ob’yekt 155MV-1)/T-55AMV-1 (Ob’yekt 155AMV-1) – Versions powered by the 691 hp (515 kW) engine V-46-5M. T-55M5 (Ob’yekt 155M5) – This modernization kit adds convex explosive reactive armour “Kontakt-5” panels around turret front, armour panel on glacis plate, a longer hull, a new style fire control equipment with stabilized TVK-3 and TKN-1SM sights for the gunner and commander, an improved V-55U engine (or V-46-5M) and a main gun stabilization system. The original 100 mm D-10T2S gun is maintained. Combat weight is less than 40 tonnes. T-55M6 (Ob’yekt 155M6) – A more radical upgrade with longer chassis with 6 road wheels each side, a 690 hp V-46-5M diesel engine and with the complete turret with automatic loader and the 2A46M 125 mm main gun of the T-72B. Also, the protection was increased to T-80U level. 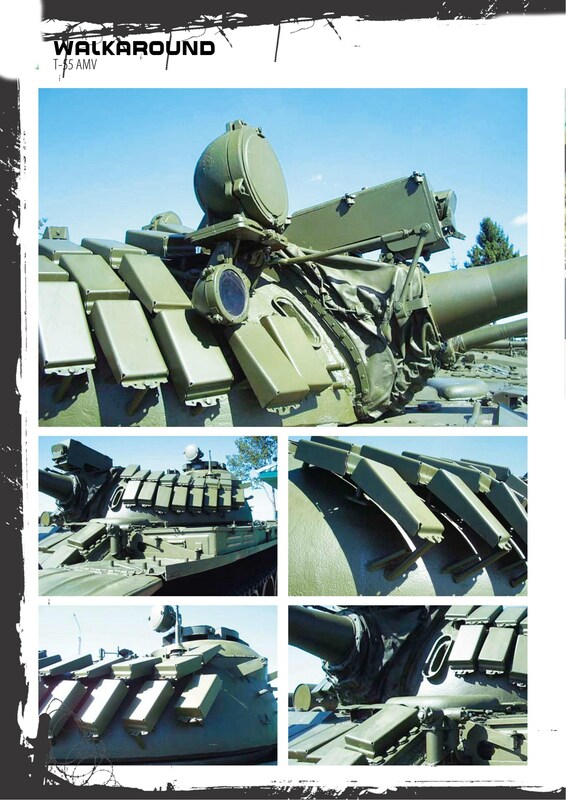 Optionally, the tank can be equipped with the 1A40-1 fire control system with the 9K120 “Svir” ATGM system (as per the T-72B) or with the 1A42 and 9K119 “Refleks” systems (as per the T-80U). Combat weight is 43 tonnes.